Underrated slim clean pure look, neutral, natural sound, no gimmicks! Sound quality is what matters. The CDT clean looking amplifier line adheres to the most stringent engineering principles to bring you an unparalleled listening experience in the automotive environment. 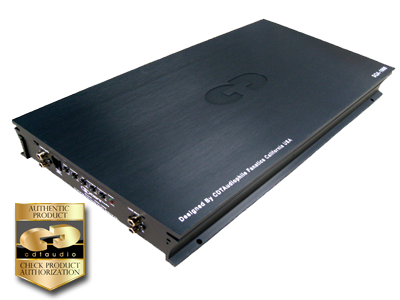 We offer a very flexible multi use amplifier Guaranteed values and a detailed power specification of each model. Typical power values are approximately much higher than rated, a specific individual birth/test sheet is supplied with each amplifier. SQA-Series Mosfet Class AB amplifiers have internal variable 24/db per octave high and low pass adjustable crossovers. Built-in subsonic filter. 5 way protections. 2 Ohm Stable circuits. Soft Start/mute circuit. Trimode output configuration. Daisy chain through output RCA. Input level controls. The amplifier utilize massive robust power supplies and amplification stages for the maximum installed flexibility, impact reliable performance. CDT Audio amplifiers have evolved over decades to include those components and design features, which provide optimal performance and virtually eliminate problems. No money has been wasted, building-in features that make no difference to the performance or reliability. On the other hand every conceivable problem has been anticipated and protection to the degree it is feasible has been included in CDT amplifier. This represents a best of breed philosophy in the industry.